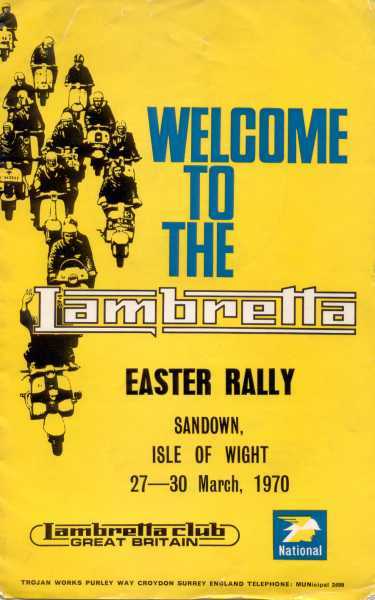 Isle of Wight Lambretta club Rallies. 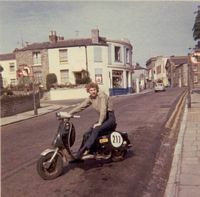 The first is one of me on my second scooter, a tuned Li200 in pseudo race trim,( ignore the hair do!) the next are the same scooter in a later guise and the last one is about the only pic I have of the 1970 rally, Taken on the hill climb, as you know the weather was poor and so was my camera! The following further images of the 1970 rally have been kindly donated by Andy after discovering them during a late spring cleaning. 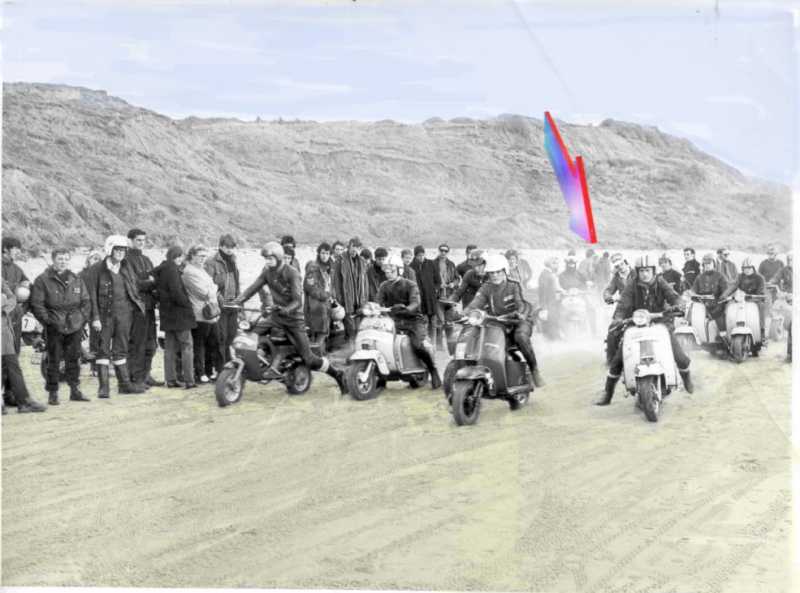 The piccy with the big coloured arrow is the start of the sand racing with Andy and chums huddled together around their doomed racer. 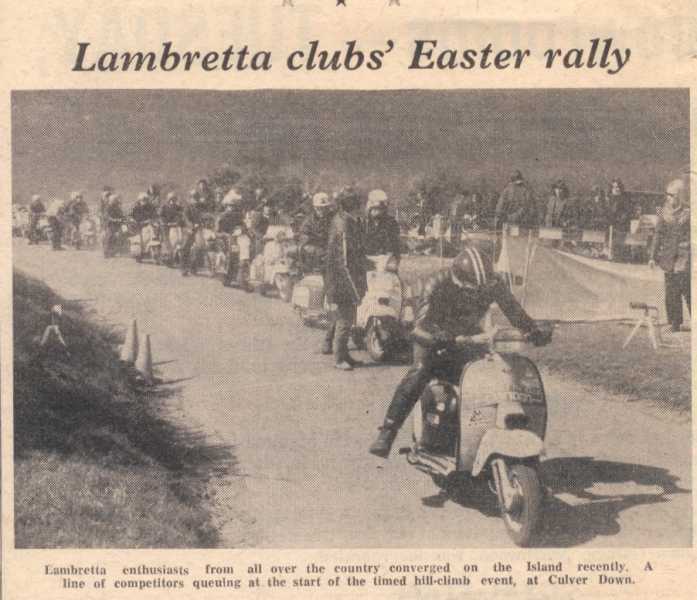 Copyright to all except the beach racing pic is I guess Lambretta club of GB, the beach pic is © Isle of Wight County Press. 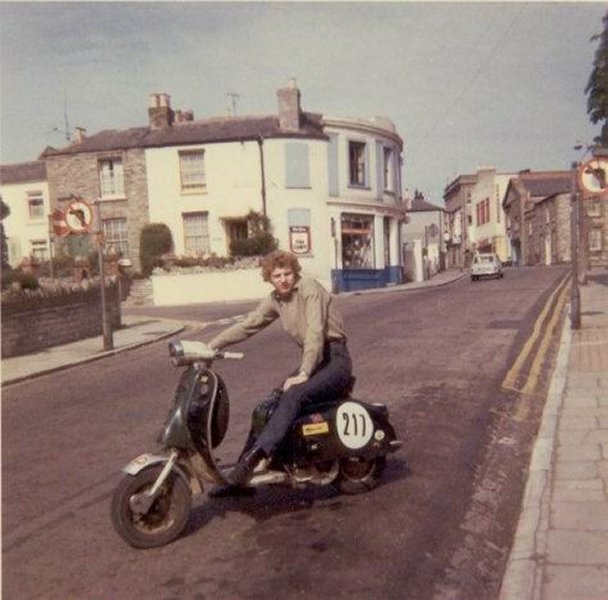 Well, what can I say about those great Lambretta Club of Great Britain Rallies that were held over here on the Isle of Wight during the 70's that hasn't already been said? In truth, Probably very little, but as I was there at all of them I'm going to say it anyway! So, let me set the scene a little. 1970.. I was 18 then, been scootering for two years and was for my sins the Secretary of the Island's biggest scooter club " The Riot Squad ". 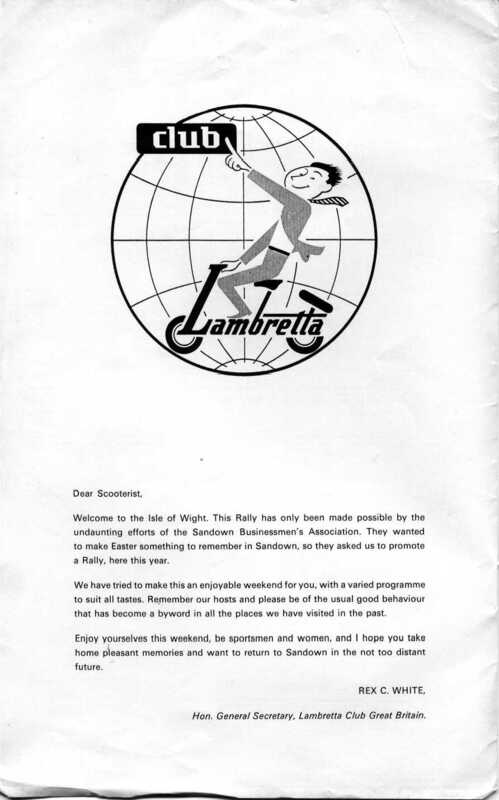 We were not the official affiliated Lambretta club of Great Britain club for the Island; they were the Seagulls; we were a more youth orientated and raucous band that had dedicated our lives, and most of our wages, to SPEED! This then was the group that turned up at the rally H.Q to announce that we were here to help. To our surprise our 'kind' offer was taken up and we were asked if we could provide marshals for the road trial. 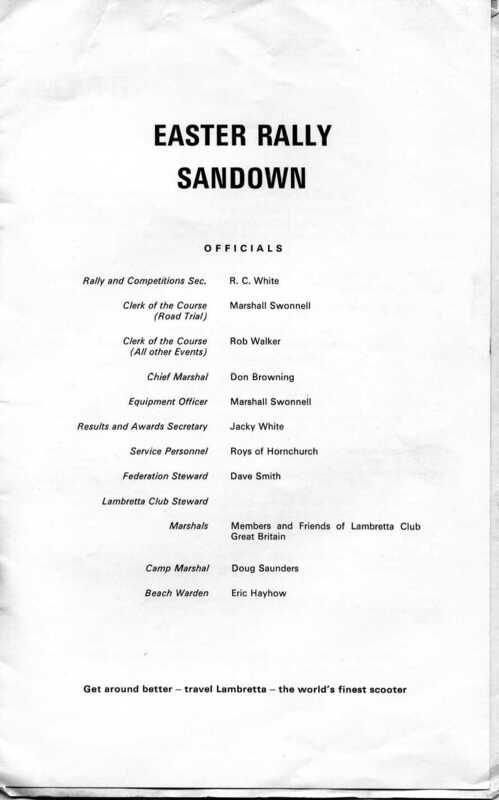 Suitably impressed by our new-found status we proceeded to race around Sandown in order that we might impress all and sundry. Amongst our club members, it would be fair to say, were some fairly strange people and it soon became evident that it wouldn't take too much effort to easily gain an audience amongst all these 'Foreign' scooterists. That duty duly completed we set about nosing at as many scooters as possible and talking 'techy-tuning' with any one that would listen. 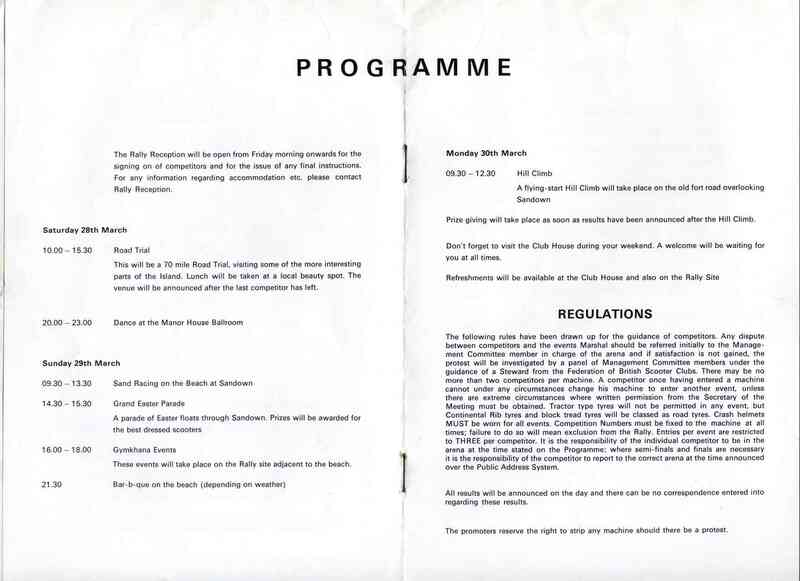 The day of the road trial dawned and our members duly presented themselves at Rally-Control. There we were instructed in how to marshal, what to do and more importantly what not to do before setting out in a convoy behind the one of organisers' cars to be dropped off at remote points around the Island. What an odd mix of competitors we came across that day! They ranged from the extremely serious; who argued the minutiae of rules and official times with us; through the cheery who were just out for a ride; to the downright lost who came through our checkpoints time and time again from every conceivable direction. For our efforts that day we were allowed a free entry in the sand racing the next day. So, early on a damp Sunday morning the assembled crowds in Yaverland beach car park were treated to the strange sight of a van disgorging a dozen 'Parka' clad individuals and a bizarre cut down Li 200. Standing no higher than your knees, all its bodywork removed, headstock cut down to about half its normal height and with a 5 gallon petrol tank from a Norton grafted between the headstock and where the toolbox should have been it was probably the most unsuitable entry for the event! This beast was fast; in a straight line; however trying to negotiate any sort of twisty course whilst having to constantly 'dab' with your feet because of the ever softening sand whilst in a typical sprinter stance was nigh on impossible. So after a stunning dash of the start line, the rest of the race consisted of wallowing along at the back of the field trying not to end up face down in the sand! We thought our luck would be better next day in the hill climb event. This was held on a private road that takes you to the top of Culver Down.  The road is steep, twisty and narrow with poor visibility. The ideal hill climb venue! Our little 'Kneeler' would be well suited to this event, very light, highly tuned and low and of course we knew the road like the back of our hands. We were going to make a name for ourselves at last. Sadly, scrutineering put paid to our dreams! Not only were those nice scrutineers unimpressed with our engineering prowess they took a fairly dim view of our protective clothing. Phrase such as " What do you mean mate, I got a parka on and two jumpers!! I won't feel a thing if I fall off!!" failed to convince them and we were relegated to spectator status. Away from the sporting event side of the rally, we had a thoroughly good time. Being the local lads, we of course had the luxury of going home every night, to a good meal, warm bed and an endless supply of dry clothes! A point that we took great pleasure in rubbing in! As 'arrogant; spotty and immortal' youths on their home patch we were obviously out to impress and road-race with as many individuals as possible. Our scooters were deliberately down beat and I suppose 'tatty' looking on the outside. Never the less they certainly didn't hang about, a fact that was regularly proved to anybody that cared to try and pass us. Obviously, our knowledge of the local roads gave us an advantage, but as long as I live I will never forget the look on the faces of the two leather clad guys who were flat out on a works tuned Arthur Francis special, when we overtook them just outside of the village of Brading. We were two up on a series 2 Li, complete with front 'D' bars, Floridas, back rest and a back rack, with our unzipped Parkas flapping like sails. We gave them a friendly gesture and they chased us the 4 miles to Ryde but couldn't get close. When we got to Ryde, we went over to chat to them but they weren't too happy to have been 'blown off' by a pile of junk! 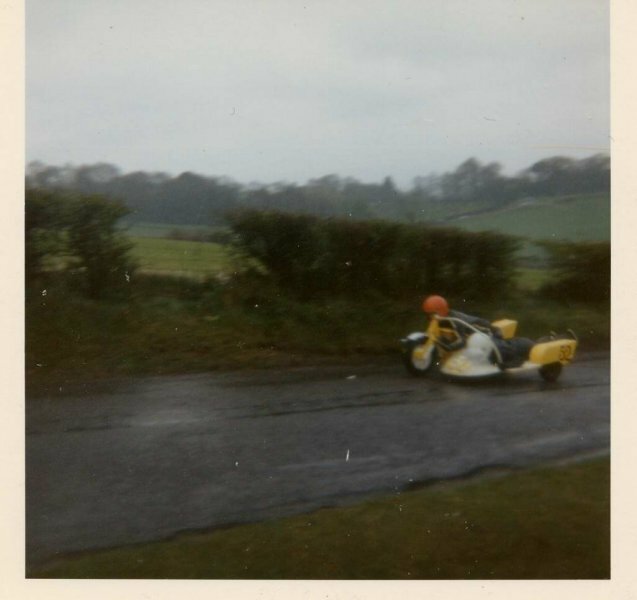 Little did they know that under that hand painted old bodywork was a 235cc GT engine, with full race porting, chrome piston, high compression head and running 101 octane fuel through an Amal TT carb with twin float chambers! There's a lot to be said for hiding your light under a bushel! 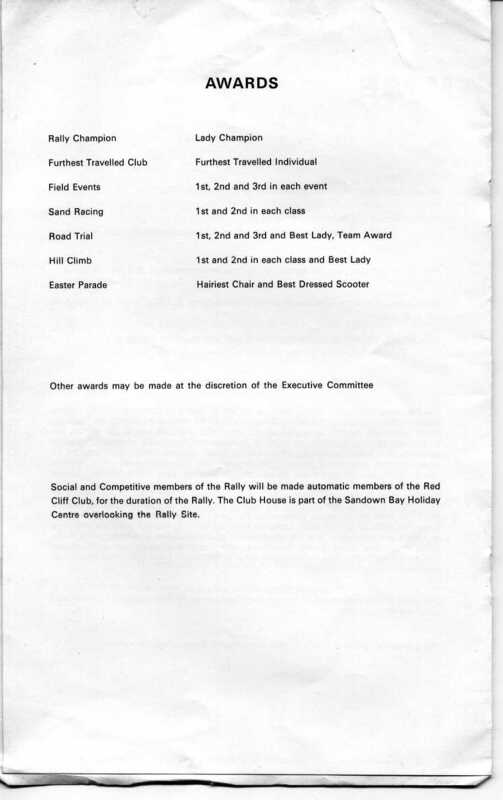 The subsequent rallies were just as much fun and we as a club became even more involved with them. The next year we met up with LCGB officials some months before the rally and did some promotion and organising locally for them and again marshalled at the road trials and helped wherever we could. 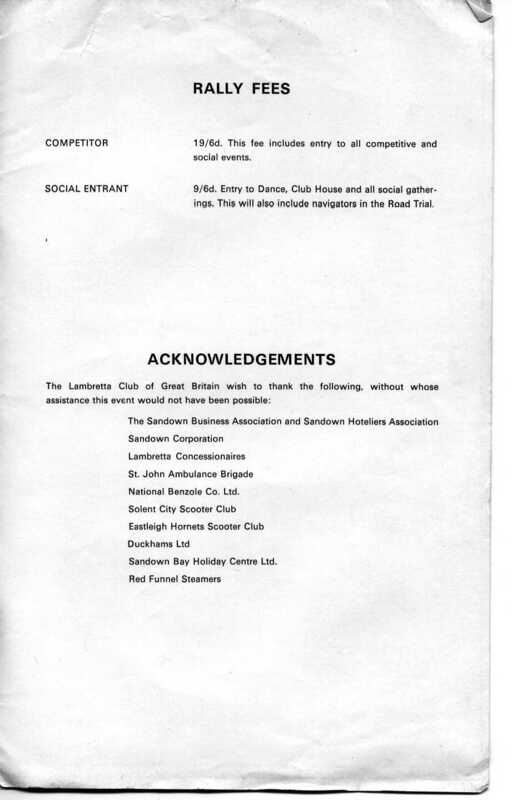 We received an official letter of thanks from LCGB and we wrote a couple of very small bits for Scooter Monthly ( I think that was what it was called) about the rally and about our club. Anyone got an Li150 for sale for £65??? Have a read of Andy's own website, http://www.gdtp.freeserve.co.uk/ all about crash sites of wartime fighter aircraft around the Isle of Wight.